temperatures are rising – cool down! With temperatures quickly rising, we’re all looking for ways to cool down. 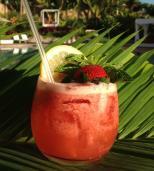 I saw these incredible looking and tasting drinks developed by mixologist Kerry Mekeel at the Hotel Wailea in Maui. One sip and you’ll be island-bound in no time! In a blender add strawberries and lemonade, after thoroughly blended, add to vodka and shake well. Tear the mint leaves to release the flavor and scent, and then add to cocktail. 3 strawberries to one cup of lemonade should make enough juice for 2 cocktails. To make fresh liliko’i juice you need 1 liliko’i per 1 cup of water. Use all of the insides of the fruit: seeds, pulp & juice. To sweeten, you can use organic cane sugar, pure honey or agave nectar. If you use sugar add 2 tablespoons per 1 fruit/1 cup water. If you use honey/agave, use 1 tablespoon. Liliko’i can be too tart for some, so make sure the fruit is in ripest stage. Also, add more or less sweetener according to your personal taste. Add rum and lime juice to glass, then add 1/4 pineapple juice to 3/4 of coconut W\water, to fill the remainder of the glass. For a sweeter drink, add the juices in equal amounts.